Home » Без рубрики » Test design and implementation. Our test system has a pretty simple configuration, so I do not want to bother you with the detailed description of it. Simply – it’s just a standalone execution of a test.py file with all requirements (test setup and tear down) in local internal test utility. Helper local utility has a usual amount of preparation functions, test data loading and some other configurations. In the very end of test loading, it just compares a node-set result of “real” scan (software and hardware nodes in a database after the scan) with predefined node-set (from test.py). Node set we usually expect at the end of the test should be added by the developer when product discovery pattern is ready or have a new feature or fix. Now I’m trying to implement entirely new and somewhere different test design because current is not flexible enough and require a lot of time to run. I’ll describe the original design of test in future, in a separate thread. Making tests was torture when I came to “named” project. Nobody understands or even can describe the whole picture of a test run. People make tests by some “golden standard” which never works and usually was un-reproduce-able. In other words – tests do not work (and never worked before for this particular case). Team members were trying to automate some routines of test writing or executing from time to time, but with no big luck. I was trying to make that one “gold standard” until I tired of this. The first attempt was to implement a better syntax highlighting for TPL (TPL – tideway pattern language, further “tpl” and “tplpre”). We used very poor syntax highlight for N++ and Vim from the beginning. This type of editors is good enough for small changes and bash scripts, but not for the development and dynamical modifications for tpl. Had begun from Sublime text 2, but later I moved on 3rd version mainly. 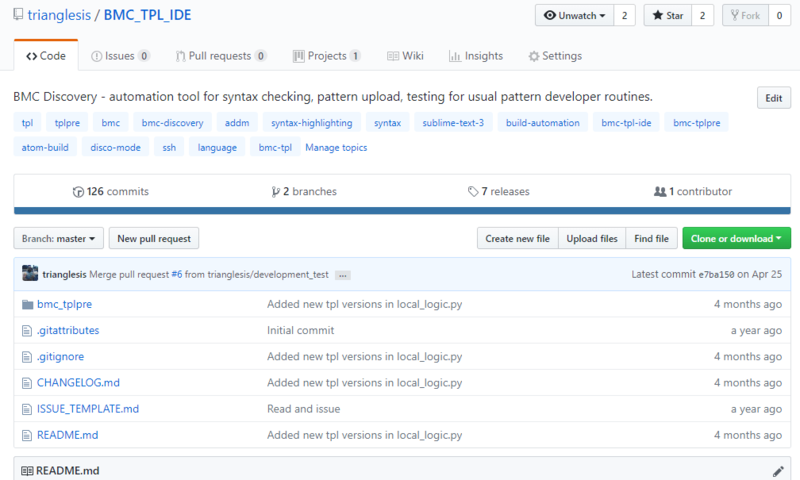 Here is the latest version on GitHub. Further development of it was suspended and transferred to Atom. Forgot to mention – I’ve tried to automate pattern loading, syntax checking and test run on N++, firstly, before I start developing syntax highlight. And the very first attempt was just to automate small amount of daily routine using windows CMD + OpenSSH and N++ build system. Fortunately, I can’t find that old records to show something for you now. Syntax, completions, tests small automation attempts. Hence with new syntax highlight and auto-completion snippets with TPLlinter module tplint (by Ladkau, Matthias), the development routine became smarter and more enjoyable. New syntax markup allows you to close code blocks, insert smart indent, close most common tags, and keywords and even show and complete all tpl built-in functions from official documentation. INFO: Open session with ADDM. INFO: Patterns zip to ADDM upload: PASSED! Uploaded /usr/tideway/TKU/Tpl_DEV/test_pattern.zip as knowledge upload "test_pattern upload 20"
Get results, change a pattern to catch new outputs. 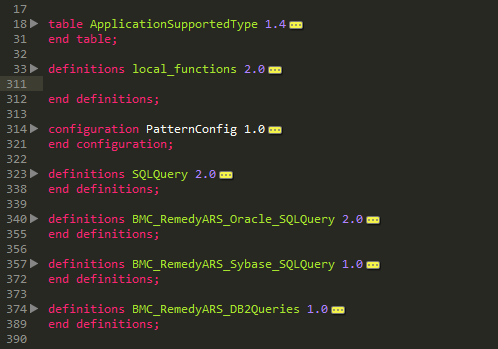 Also, this version includes separate logic for external developers, who work on custom tpl patterns outside of BMC. It detects paths hierarchy and extra arguments to use other steps to automate routines for other developers. 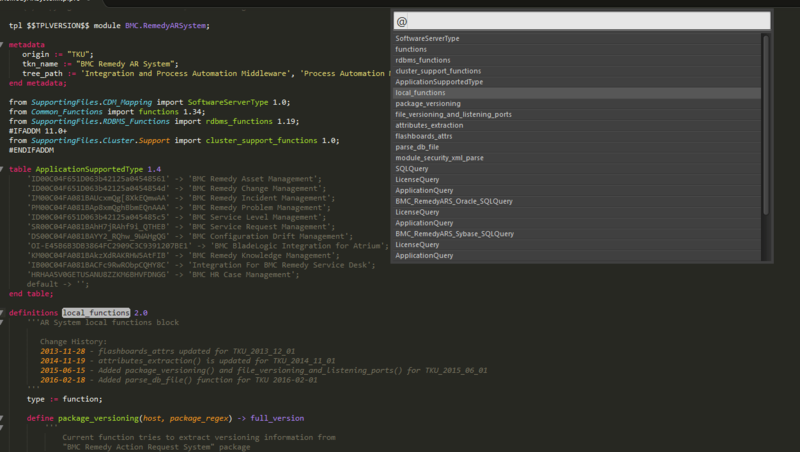 Plugin development was finished after manager’s request to use an open source Atom editor. Moving process requires a lot of changes to run from Sublime to Atom. I can not port it with simple files format converting to a new style. As a result, I’ve changed a lot in current design and fix old bugs of syntax highlight, build system. Moreover, during a move, I used a new format of auto-completion logic from Atom built-in. 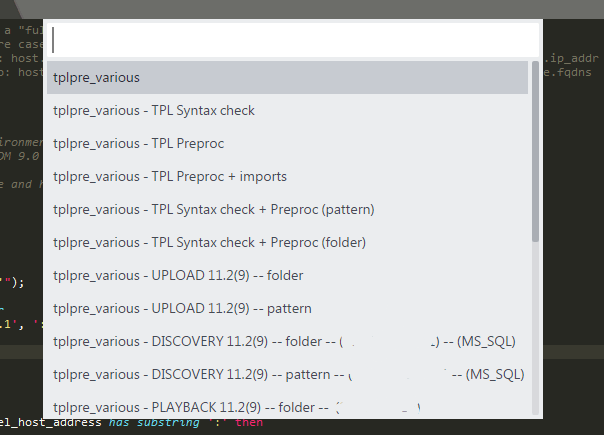 New way also allows me to include references for any documented tpl functions and keywords. Automation logic I also change, it became friendlier to the user, and also it contains additional output messages and error handling. The last and most complex feature was the test running automation. Then, tests automation procedure on that level allows a user to select the desired test level. And then test single case for a pattern, or include all “patterns” which were imported and changed from last time. More advanced logic also consists of a routine to execute all related tests. Which means you can perform current pattern test and ALL other tests where this pattern was included somehow or imported. Probably, products like RDBMS systems can run for hours. And I also want to mention, that last TPL IDE version can execute tests in a development environment with configured shares and file hierarchy and single mode, when just only selected files the to a temporary folder. Note: this is a very early example, and I stopped the development of this particular plugin. Now everything became more complicated, but anyway, this is the place where it all has begun. NEXT: How first automation works with examples. Tagged Atom, Automation, BMC, Notepad, Python, QA, sublime, Syntax, TPL, Unittest.